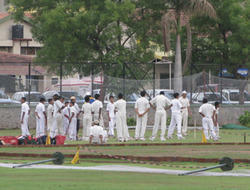 - Cricket has been the backbone of development at Deccan Gymkhana. We offer a verdant play field, confirming to norms laid down by the Board of Control for Cricket in India (BCCI) for conducting National tournaments and is a regular venue for BCCI matches. We provide service of Batting Classes. - The course focuses on developing the fundamentals of batting technique and skills. Cricket, now termed as the unofficial national sport of India has become the religion for everyone. It has got an old history associated with its existence in the country. The oldest references to the sport in India can be dated as early as the year 1725 when some sailors played a friendly match at a seaport in Kutch. Indian cricket team has many remarkable victories to its credit. We provides Cricket Coaching, as we bring forth to our customers bat and ball game, which is an activity, based game. Basically this activity is designed to develop a higher level of concentration in the young children in Rajasthan. By playing this game, children can pay attention to their goals by concentrating with a focused mind.